Great writing and thanks for the picture. Interesting reflections too. Intriguing photograph and snippet of history – and great writing – amusing and thought-provoking.. Thank you, Noelle:) I enjoyed thinking about that empty chair! I like the way your have captured some of the dilemma of changing attitudes and times. There is always a period of adjustment to a new “order”. For a moment I thought the woman must have been the wife of the judge and getting his lunch, but such could not be. Great story. OH my gosh, I love this! The flash, the photo. Fantastic job! 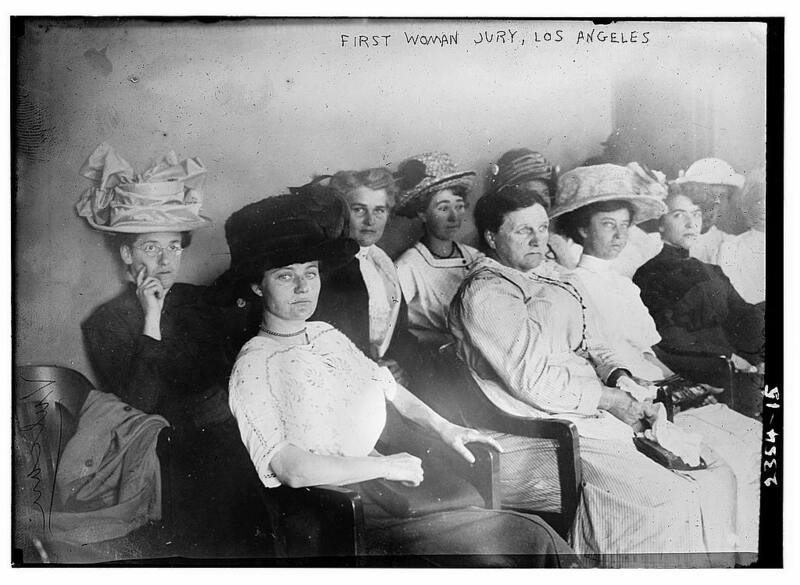 Is this the first all-woman jury? I’m embarrassing myself here and I know it. I’m confused about the dates. Was this a state-by-state law? I remember women were allowed to sit on juries but could claim exemption strictly based on their gender. No real reason was needed. It was in Los Angeles, Calif. I’m not sure about other US states or countries. If you google it or look on Library of Congress records you can read a newspaper article about it. I gather from the article that you had to be a landowner to be on the jury at that time, but I’m not sure.